Ishaan started going to daycare at a very young age. When he was around 1 year old, they made him sit on his highchair to eat. He was all excited about feeding himself at that age. I was not a very big fan of the food provided at daycare – especially lunch, most of which was non-vegetarian. I buy mostly Organic vegetables/chicken, so the thought of him eating something else everyday at daycare was not easy to digest for me. I started sending his lunch boxes (luckily this was the only daycare which allowed us to send food!). There were hits and misses, some days he would eat everything and some days he refused to touch food. Once in two weeks, they had mac and cheese on the menu. The teachers there gave him a little bit of it to him and he would happily eat it. That’s how his love for mac and cheese started. Soon it became the one dish that he would eat without fuss anywhere. Since it is a part of most of the kid menus here in US, it made us easier to eat at restaurants. I never gave him mac and cheese at home, he would eat it only outside. But then, I wanted to start making it at home. As most of my friends know, I am very fond of making things from scratch. Somehow I almost always messed up the sauce. Since it is the single most important part of this recipe, the entire dish gets spoiled when the sauce is not good. Finally a tip that I read somewhere on the internet helped me. "You have to add the cheese after switching off the heat". That was such a big help. 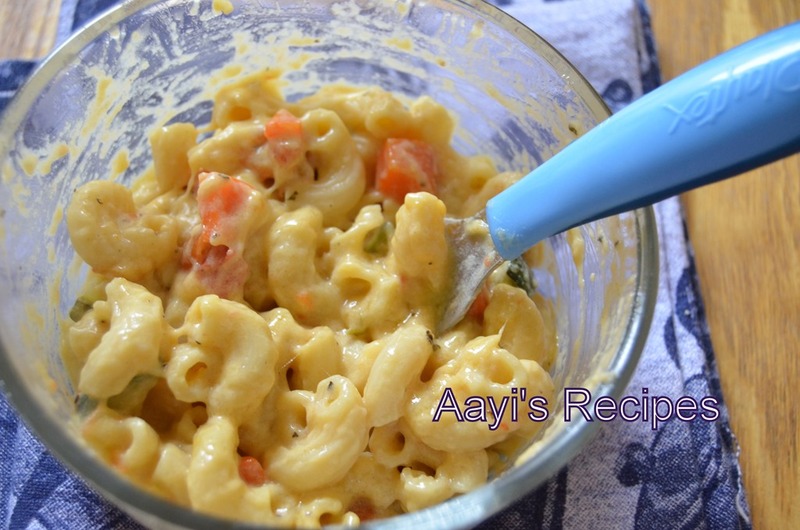 The inspiration for vegetable mac and cheese came from none other than Ishaan himself!!. Our latest favorite restaurant is Sweet Tomatoes – it has soups and salad buffet. He loves mac and cheese there. I have watched them make it many times. They make a smooth sauce and add it to macaroni. They mix it all and keep it in a hot pan. I give him some vegetables like peas, corn etc in one plate and mac and cheese in another. He recently started adding peas,corn to mac and cheese before eating!. Wow, my little chef!!. So I started making this version at home and he loved it. First time he picked all zucchini pieces and threw them away, but next time it didn’t bother him so much. V and I love this because of vegetables. The quantities mentioned below are approximates. I do not measure any ingredients. While serving it to Ishaan, I just add some spoons of butter. Cook macaroni according to package instructions. Keep it aside. 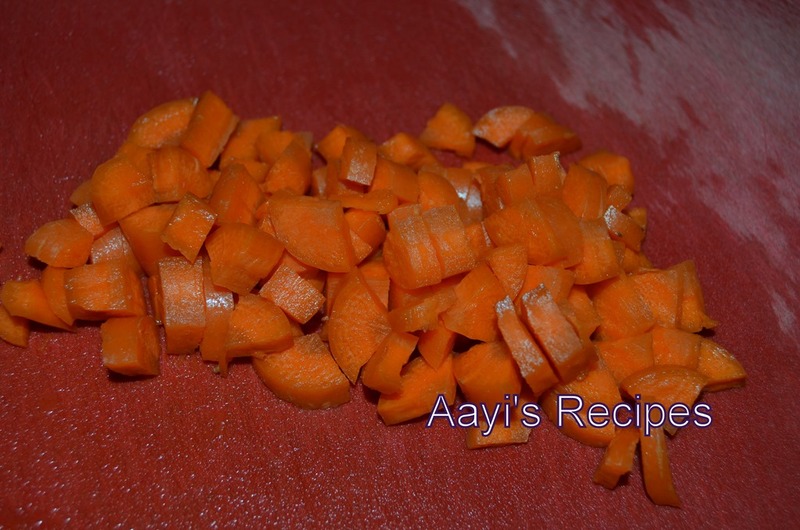 Cook carrots in little water. 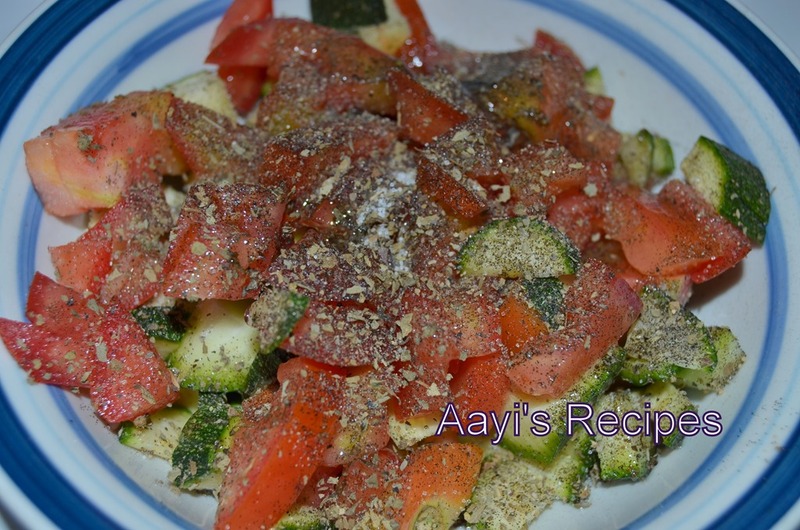 In a bowl, combine tomato, zucchini, peas, corn, dried basil, little salt, little olive oil, pepper, red pepper flakes and microwave for 2mins. This can also be done on stove top if you wish. In a thick bottomed pan, melt butter. 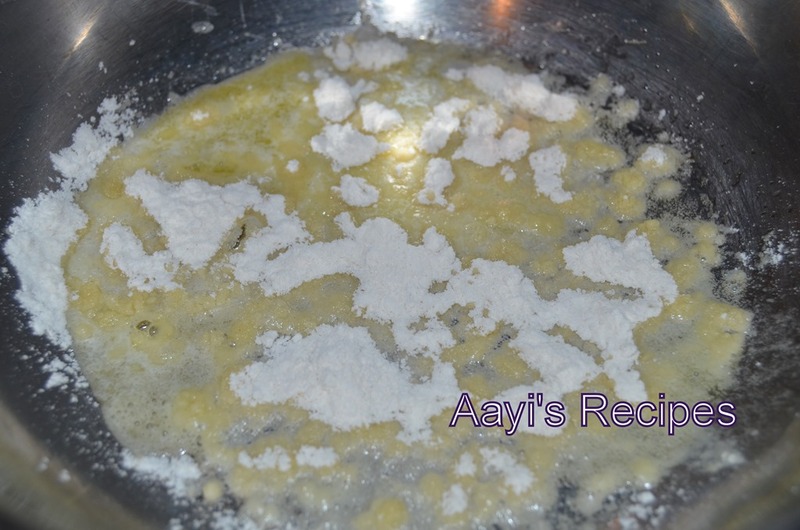 Add flour and mix. Let the flour cook, but do not burn it. Very important step. Now add the milk and let the sauce thicken. Take off the heat. 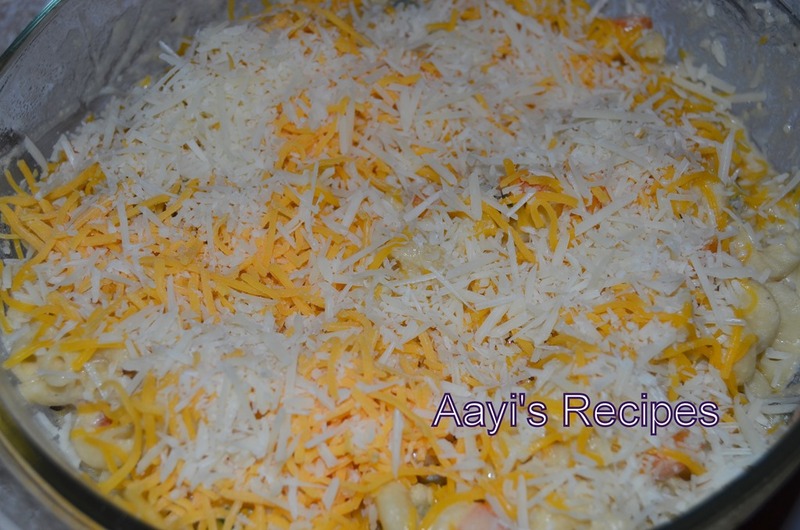 Add cheddar cheese and mix very well till all cheese is melted. 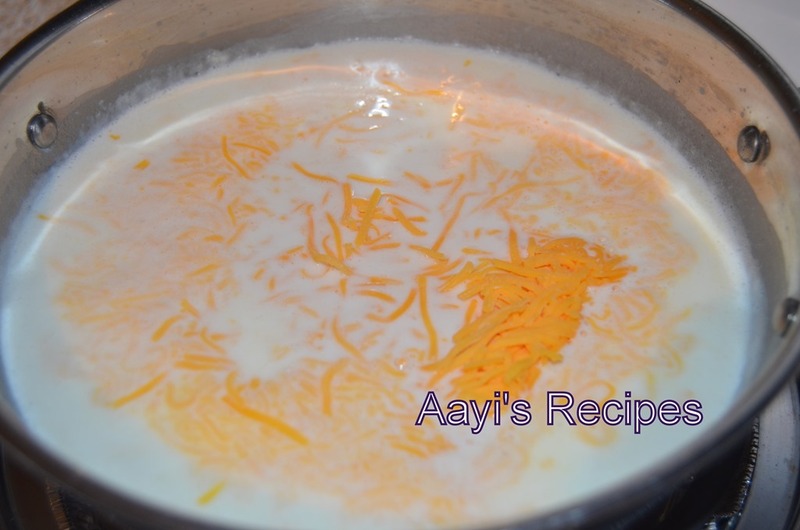 If you add the cheese too soon, the sauce will separate, so be very careful. Needs some trial and error to get this right. The sauce has to be very smooth. 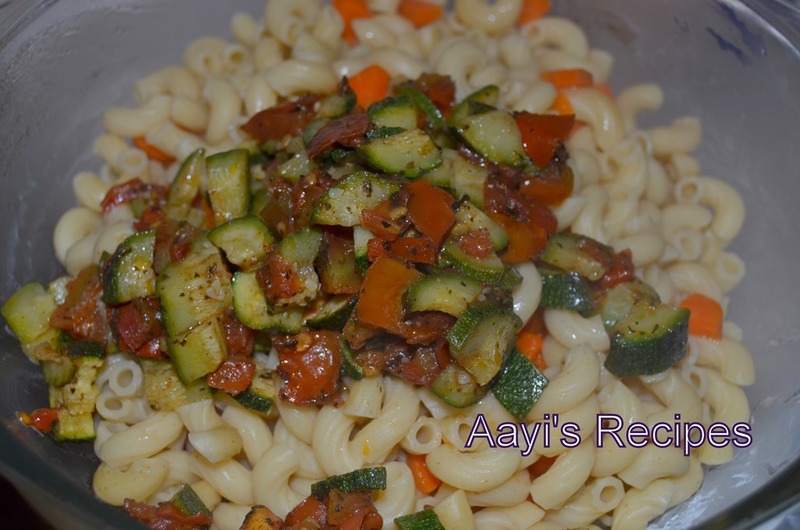 Now in a oven safe dish (lightly apply olive oil to the dish), mix macaroni, carrots, vegetables, sauce. Mix them. Top it off with remaining 2 tbl spn cheddar cheese and parmesan cheese. Bake in the oven at 350F for about 6-7mins till cheese is melted. (This step can be done on a stove top instead of oven if you do not want to use oven). I mix everything with a spoon as soon as it comes out of oven to get a smooth consistency. I have never made Mac n Cheese the traditional way nor have I made it from the box. My lazy way would be to boil elbows and then micro with some cheese and milk. BS would eat it happily as a toddler. LS likes plain pasta and not fond of mac n cheese. But let me try this way once and see. 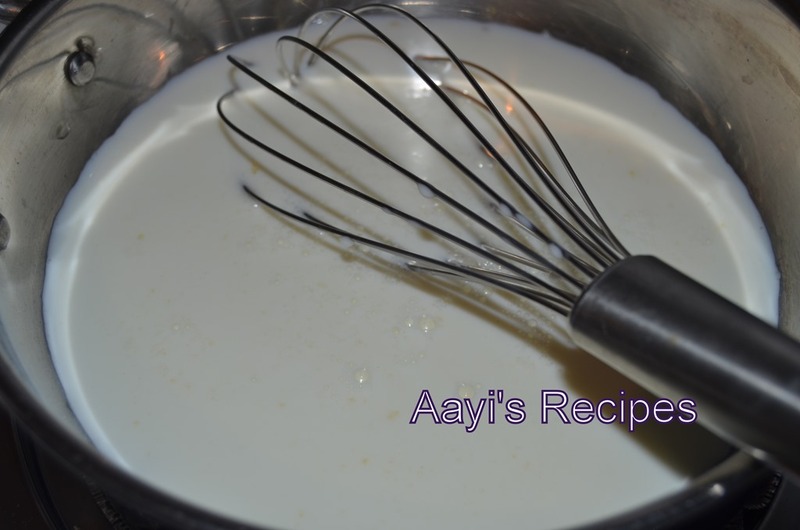 Lovely recipe….would love to try this to my toddler who is very choosy with her food…. oh what a perfect recipe for a rainy day!! 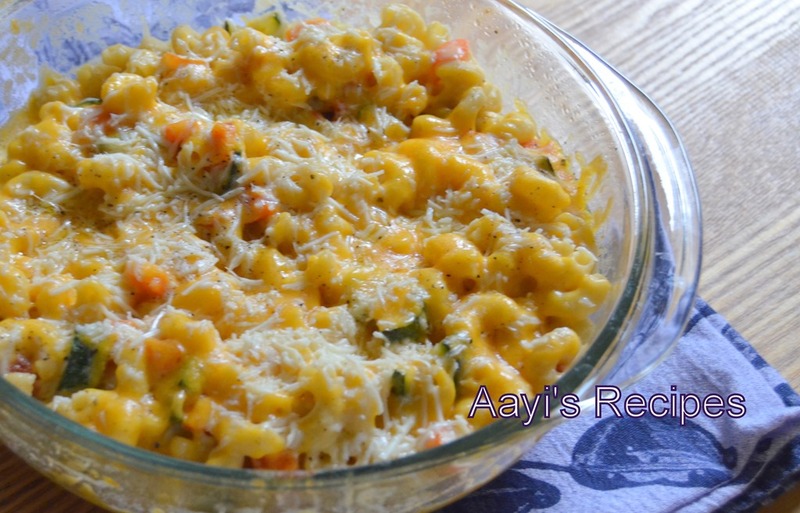 🙂 i loveeee mac n cheese.. and i have a lazy lazy version of mac n cheese … just egg yolk n milk n cheese… but adding vegggies.. yes i should! I also like a version with orange pureed vegetables – steamed sweet potatoes or butternut squash. I made mac n cheese tonight for dinner and the outcome was too good we both liked it .I followed the stove top method and added thyme,oregano,parsley and lemon pepper for extra flavour .Thanks for the recipe. Does it matter if I use block cheddar cheese and use after shredding it, Do I need to use cheese which comes as pre-shredded in the shops? Somehow, my sauce always comes grainy, when I tried making sauce without the flour, it curdled, any suggestions would be helpful. You can use the block cheddar cheese and grate it. I think you need to use little flour atleast to get the thick sauce. My friend had mentioned she just spreads a thick layer of cheese before baking. I have not tried that. My daughter likes the usual pasta, should try this one. My daughter will start preschool this September. Can you please share a list of snacks, drinks and lunch menu? Also, let me know which type of lunch box and cup would be good? I have tried many water bottles but not satisfied. Thanks for the quick reply, Shilpa! I will check these and buy them.